It’s high summer here in Wisconsin which means just one thing when it come to feeding our family: Grilling. Weather. 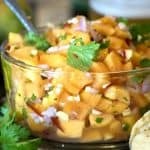 I was looking for some papaya recipes to accompany a grilled jerk chicken and I totally hit paydirt with this simple papaya salsa. If you’re looking to mix up your salsa game a bit then you are in luck. This chunky salsa recipe makes for a great appetizer or garnish. 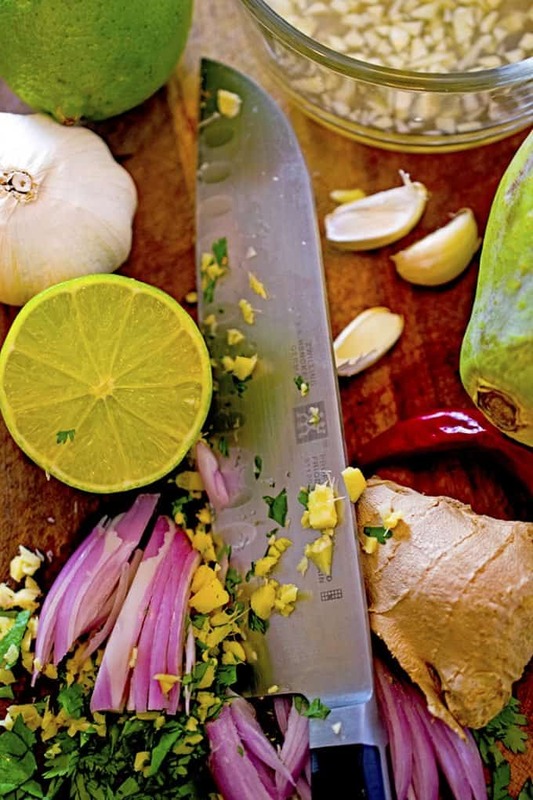 This papaya recipe starts off with a lime and a cutting board. Macerate the garlic, scallions and pepper in fresh lime juice. Use a small bowl and squeeze the juice out of couple of lime. That tangy goodness is going to help the other ingredients get better acquinted. Next chop up everything else except for the papaya and toss those ingredients in with the fresh lime juice. Mascerting the harsher aromatics like the garlic and scallions will take away their sharp edge and replace it with a mellow and pleasing finsish. 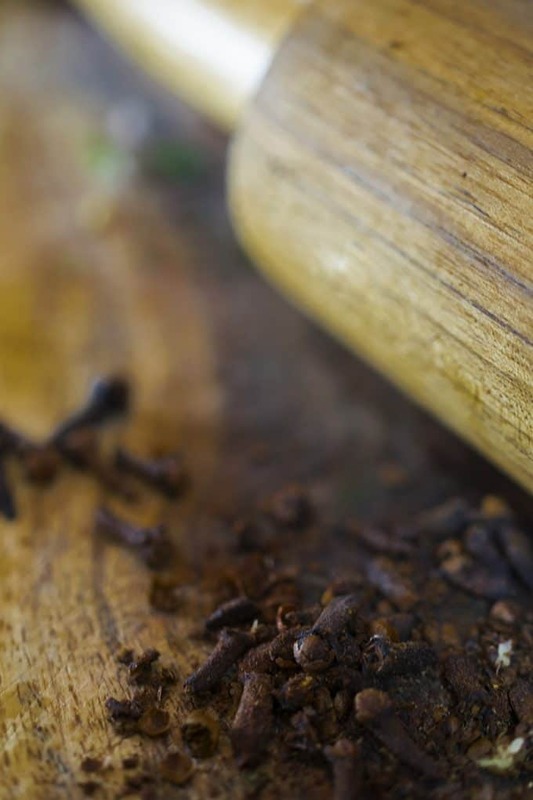 Crushing whole cloves is easy to do with a rolling pin. Most of us have ground cloves in our pantry and you may even have whole cloves sitting there as well. You can use the ground cloves if you’re in a pinch but you’ll get whole higher element of taste by using freshly crushed cloves instread. How do you crush whole cloves? Enter the rolling pin, into this recipe process! 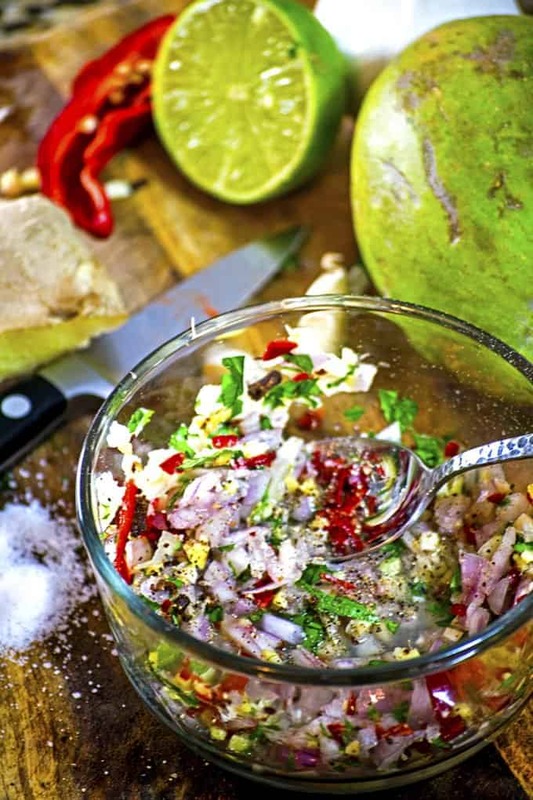 This recipe uses a couple of papayas. Slice the papaya in half, scrape out the seeds and then peel the skin off with a pearing knife. Experiment and see if it’s easier for you to skin the papaya before slicing it in half. Doing it as I show in the photo above works best for me. The next thing you’ll do is dice the papaya into chunks, about a half inch in size. Add the diced papaya to the other ingredients. 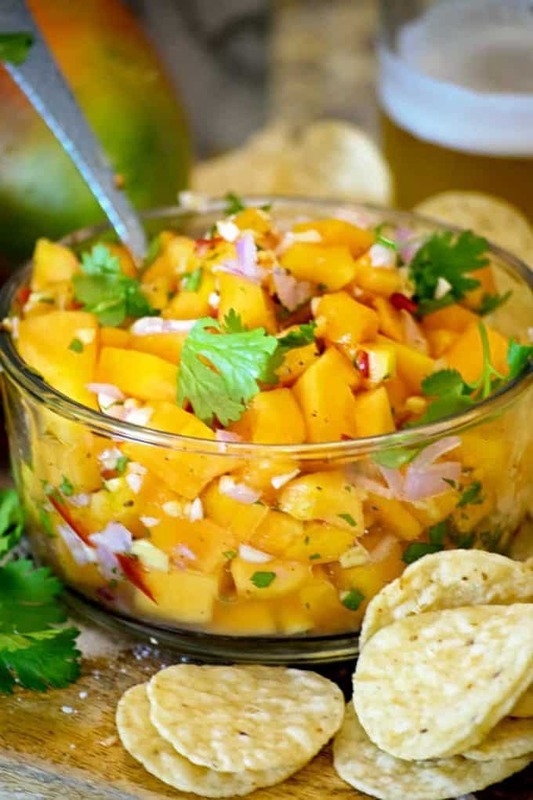 Enjoy this papaya salsa with chips or as a garnish for grilled meat of seafood. Looking for more Papaya Recipes? Here are just a few that I think you might like! 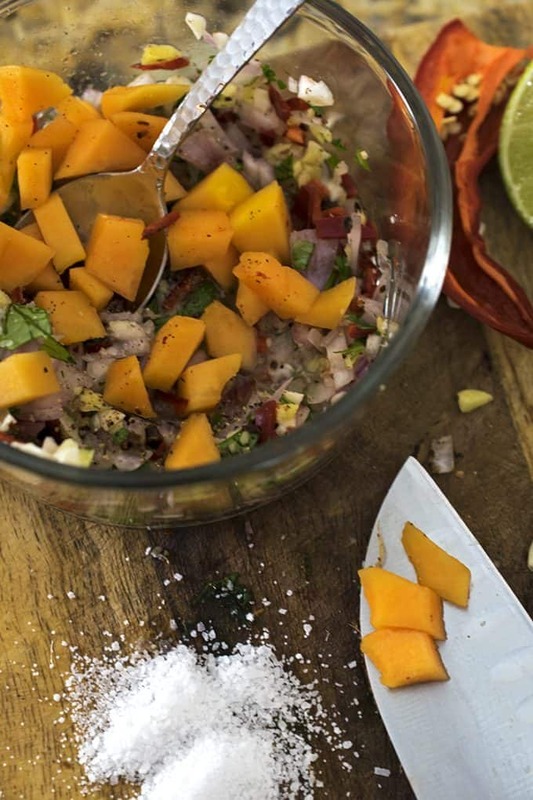 If you're looking for good papaya recipes than this chunky salsa recipe is a must-make! Use it as an appetizer with chips or as a side dish and garnish for grilled meats and seafood. Squeeze lime juice into a small bowl. then, chop up the cilantro, scallions, shallot, and cloves. Add them to the lime juice and stir lightly. Add Papaya to the lime juice mixture, gently stir while adding salt and pepper to taste. Fold in cilantro an have a fiesta! 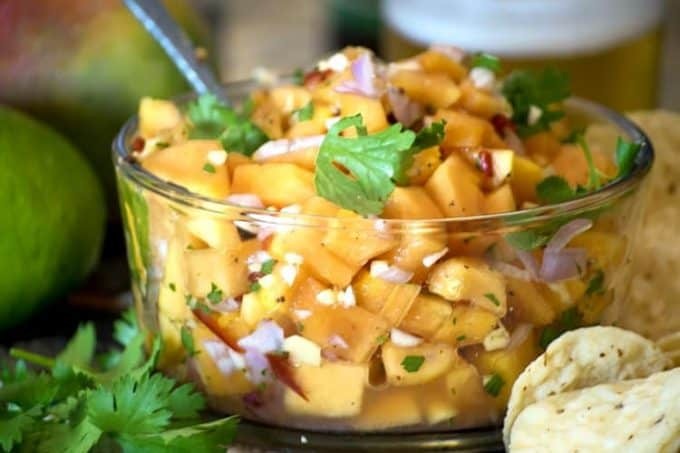 For added variety, dice up some fresh pinapple for this tropical salsa. About a half of small pineapple should be enough to do the trick! Make this Papaya Recipe and post it on Instagram. Be sure to tag us @plattertalk! Pin this Papaya Recipe for later. The thought of the tang from the lime paired with the sweetness from the papaya is making my mouth water! Putting this over baked fish! This just screams summer doesn’t it?? 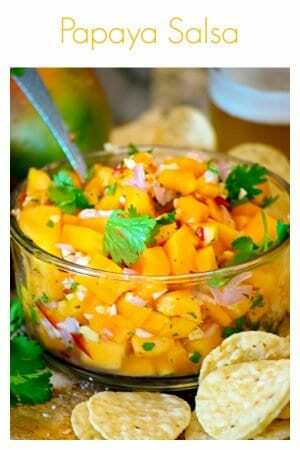 Loving the addition of the papaya in your salsa! 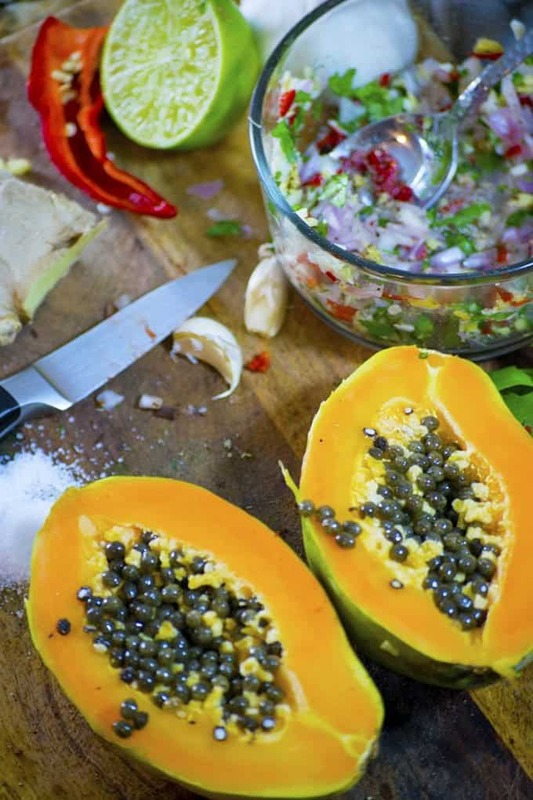 Papaya is such a delicious fruit and I’ve never thought of using it in salsa! Brooks will love it! Ah, love this!! Why have I never used papaya in a salsa??? It sounds amazing and now I need to make this asap!! Great colors, great flavor and easy! This would be an amazing appetizer, I love how colorful it is! I love the combo of flavors & the very healthy calorie count! Thanks, Sis! Can’t wait for you to see the jerked chicken that goes along with this papaya recipe! Ive always bought papaya precut in our grocery store… from your pictured Im wondering why I did that? So much easier than I thought! Now to give this salsa a try! Thanks, Michele. This was my first time using papaya. Won’t be my last! Papaya is so delicious! Love your combination of flavors, what a great recipe! I grew up eating papayas almost daily. I absolutely love them and this recipe is a must try for sure! So tasty and refreshing. I think I could top everything with this salsa! Lucky you, Kathy! I’ve just recently discovered papaya and I have to admit, I can’t get enough of them!